Hipsters: haven’t they settled down and gotten a real job by now? Actually, no—and wait until you hear the enraging trends they’re adopting now! Russian roulette: fun? I’d call it something else: dangerous. But also: kind of brave. Unless you’re a hipster, that is. What are hipsters doing these days? These days, hipsters have managed to keep the stupidity of Russian roulette but combine it with the cowardice of hipsters by playing Russian roulette with tasers, rather than real guns. While drinking beer! 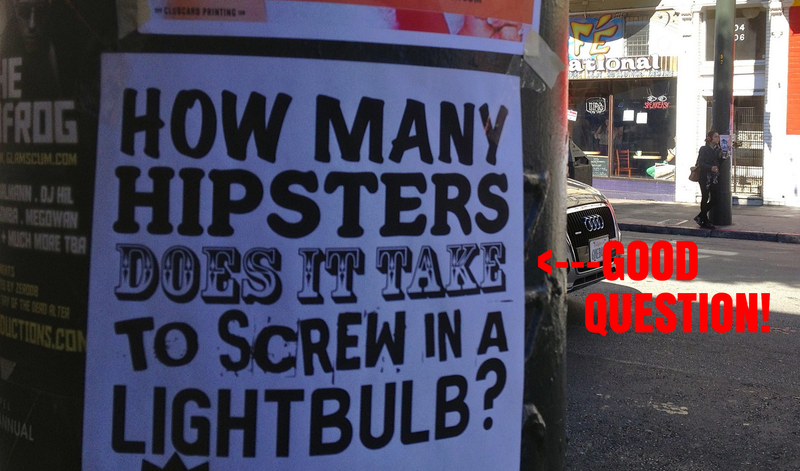 Hey hipsters, really good use of your time—not. I have an idea for a new hipster trend: working for a living and taking care of your kids. Think it’ll catch on? I highly doubt it. The problem is not just domestic. In Iraq hipsters are launching clothing lines and in Jakarta hipsters are eating Sloppy Joe sandwiches. May we travel anywhere in this world without expecting to encounter hipsters and their antics? For once I’d like to sit quietly in a restaurant and have some mashed potatoes without thinking about whether or not I and my actions are trendy. I believe many Americans feel the same way.